Play is the “work” of young children. From earliest infancy on, toys provide the motivation and the medium for children to learn to control their bodies. Toys help children understand that their bodies are separate from objects, help them learn to reach and grasp, and provide a motivation to learn to roll, sit, crawl, stand, and walk. Through play with toys, children learn concepts of shape, weight, and size; by dropping and throwing toys, they also learn about gravity. The National Institute for Early Education Research suggests that without sufficient toys, children don’t develop necessary motor skills. Children learn to use language during play with toys. Studies also show that infant toys are critical for brain growth that affects learning later in life. Toys help prepare children for the academic learning that they will encounter when they enter formal school settings. As children get older they learn about sharing, taking turns, and working collaboratively with others. Toys often serve as emotional security objects for young children, acting as a bridge for the security of a loving caregiver during times of separation. Toys provide opportunities for laughter, fun, and inquisitive exploration of the world. These are critical opportunities for the healthy development of children—emotionally, intellectually, and physically. Nearly 14 million children in the United States – 22% of all children – live in families with incomes below the federal poverty level – $22,050 a year for a family of four. 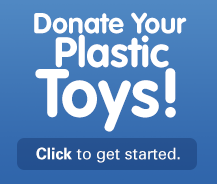 Just by donating a gently used plastic toy, you can make a world of difference in the life of a disadvantaged child and at the same time help keep non biodegradable plastics out of our landfills.